1. Pick up CDL Handbook at any Ohio License Bureau, or click here to download it. 2. Study the sections of the CDL Driver Handbook that pertain to the vehicle(s) you intend to drive. 3. Take CDL written exams at your County written exam station and purchase permit -$27.00. 4. 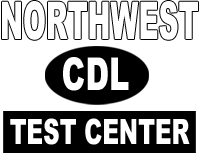 Call Northwest CDL Test Center, Inc. to schedule your CDL Driving Exam (Vehicle Inspection, Manuverability, Road Test). 5. Take CDL Driving Exam. 6. Purchase new CDL driver license at any Ohio license bureau - $43.00. Must have appointment to take CDL Driving Exam. All fees to be Pre-Paid (at time of scheduling). Must pay by cash or credit card (Visa, Mastercard, Discover). Taxes payable on rental fees only.